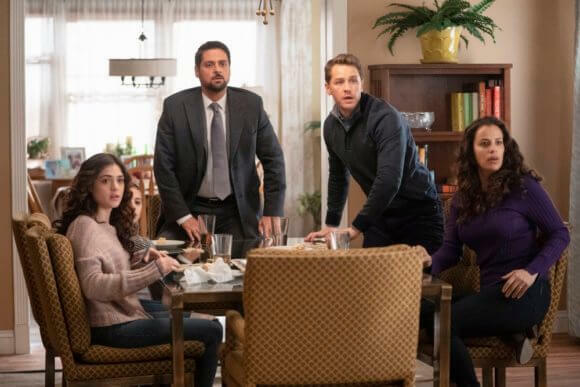 Manifest Season 1 Episode 13 Recap: "Cleared for Approach"
“Whatever happened to us on that plane also happened to Zeke in that cave,” says Dr. Saanvi Bahl (Parveen Kaur) to Ben after testing Zeke’s blood work in season one episode 13 of NBC’s new mystery thriller, Manifest. Episode 13 begins back in 2017 with Zeke (Matt Long) in a supply store buying a bottle of water. He makes small talk with the clerk who, as Zeke’s leaving, says he’ll see him in a couple of days. Zoom forward to present day and Michaela (Melissa Roxburgh) and Ben are talking to Zeke about what happened to him. He explains he went hiking for what he thought was just two weeks. It got extremely cold so he found refuge in a cave. Zeke was frozen inside the cave and to stay warm he started burning what he had on him – except for the picture of Michaela. Something happened that felt like an earthquake. The cave shook, breaking the ice so he could crawl out. Ben (Josh Dallas) and Michaela think Zeke should come back with them to the city and get checked out in a hospital. Zeke says he’s not ready to go anywhere just yet. Michaela tells Ben she’ll stay with Zeke, but Ben wants to get him tested to see if he might be the missing key to what’s happening to them. Michaela knows they can’t make Zeke leave and says she’ll handle it. Ben’s nervous about leaving Michaela with Zeke, reminding her they don’t really know anything about him. Ben believes it’s strange Zeke hasn’t asked to contact anyone since finding out he time traveled a year. Michaela reminds Ben she’s a cop and can take care of herself. Michaela tells Ben to take Cal to get checked out. Ben agrees but warns Michaela to be careful. Back in the city at the hospital, Saanvi checks out Cal (Jack Messina) and tells a relieved Ben that he’s fine. Ben gives Saanvi a piece of cloth that has Zeke’s blood on it for her to test. While driving back to their house, Ben, Cal, and Grace (Athena Karkanis) see a billboard demanding an investigation into the passengers of Flight 828. Cal asks what the billboard means and Ben blows it off saying people having too much time on their hands. Out in the wilderness, Michaela tries to get Zeke to understand about coming back and losing time. She touches Zeke and they both experience the calling, complete with visions of the two standing outside under the stars at night and hearing Zeke’s voice say, “Go back.” Michaela explains about the callings and comes to the conclusion they both need to go back to the cave. Zeke wants to rest for a while before they go. Plus, they’ll need supplies. Michaela volunteers to get the supplies. Ben, Cal, and Grace arrive home and are greeted by Olive (Luna Blaise) who first hugs Cal and then punches him for scaring her by leaving. Grace and Ben talk and agree not to tell Olive about the Callings to keep her safe. Michaela finds an old missing poster of Zeke at the supply store and asks the cashier if she can take it. He doesn’t have a problem with her taking the flyer, adding that he believes Zeke killed himself because his kid sister died up on the mountain. Michaela quickly leaves to get back to Zeke. Jared (J.R. Ramirez) visits Ben and Grace to see how Cal’s doing and to see if they know where Michaela is. Ben explains that she stayed up in the mountains because she needs some alone time. A rock comes crashing through a window and a male voice is heard outside the house yelling, “Freaks.” Ben and Jared rush out in time to see a truck speeding away. Jared gives chase as Ben turns back to the house and finds a big red X painted on his front door. Michaela returns to the cabin to find that Zeke has left. She hurries out and quickly tracks him down. She brings up his sister, Chloe, and Zeke stops dead in his tracks. Michaela tells him she’s trusting him, and he needs to trust her that they need to go to the cave. Zeke reluctantly agrees to take her to the cave but that’s it. Olive confesses to Ben that she knows about the callings. Ben asks how and realizes Cal told her. Olive thinks Ben didn’t trust her with the secret, but he explains he trusts her and was only trying to keep her safe. He promises his daughter there won’t be any further secrets between them. Michaela and Zeke find and enter the cave to investigate. While looking around they touch again and experience the calling. Once again they find themselves outside under the stars. This time they hear Zeke’s voice saying, “Go back.” Michaela realizes it’s not the cave they need to go back to. Zeke tells her he thinks the calling wants him to go back to where Chloe died, confessing he killed his little sister. Michaela asks what he means by that and he reveals that when he was 15 he took Chloe with him hiking. He took a call from a girl he liked and told his sister to leave him alone. That’s when she had the accident and died. Michaela tries to tell him he was young and Zeke gets angry; he doesn’t want her to make excuses for him. Zeke’s sure it was his fault. Michaela agrees it’s his fault, adding that she gets it. Michaela then confesses she killed her best friend because she was driving when they had an accident and she’d been drinking. Ben visits Saanvi and she’s excited to reveal that Zeke’s blood sample checks out. He went through what they did. Saanvi also says she did some checking and there was an electrical storm in the area where Zeke was hiking when he disappeared/time-traveled. Ben thinks maybe black lightning might be responsible for the time shift. He then tells Saanvi to be careful, admitting he worries about her especially since the incident at his house. Michaela and Zeke make it to the spot where Chloe died. The location’s marked with a plaque his parents had made in her memory. Zeke reminisces about how he and Chloe used to build little towers. He admits his parents wanted him to build one at her memorial. Michaela thinks she and Zeke should build one for Chloe now. <>Jared catches the creep who vandalized Ben’s house but doesn’t have enough on him to make it stick. He shows Ben that the creep has a website dedicated to investigating the passengers from Flight 828 because he thinks they can’t be trusted. Later at home, Ben sees a picture in Olive’s book of the peacock he saw a few weeks ago in a calling. They start to talk about it and she explains in some mythologies a peacock is the symbol of resurrection. Ben’s peacock lesson is interrupted by a call from Jared letting him know he had to let the suspect, Cody Webber (Patrick Murney), go. Ben pays a visit to Cody at his place of work. He demands Cody leave him and his family alone. Cody shows him a photo of Cal and says, “Cute kid. I wonder if he bleeds.” Furious, Ben gets in Cody’s face and warns him if he doesn’t back off, he’ll see what a man who came back from the dead can do. Police show up to take Ben in because Cody has been live-streaming everything. Grace talks to Cal who’s sitting outside on the porch and he asks what’s wrong with him. He believes he’s a freak. Grace tells Cal not to listen to those mean people. Cal wonders if he’s still himself after disappearing, and Grace assures him he’s still her son and that a mother always knows. Cheered up a little, Cal goes inside to help with dinner. Jared yells at Ben at the police station, telling him he played right into Cody’s hands. He warns Ben that if he does something like this again, he won’t be able to help him. This time, however, he’s let go with just a warning. Zeke and Michaela finish building the tribute tower, but Zeke doesn’t feel any better. Michaela thinks it will help him feel the weight of what he’s carrying feel a little less. They touch again under the stars and experience the same calling, only this time it’s Michaela’s voice instructing them to go back. Zeke figures out he’s supposed to go back with Michaela to the city and as they start to head back, Zeke holds Michaela’s hand to help her step over some dead logs. Lightning flashes and lights up a drawing on the rocks that looks like Michaela and Zeke holding hands. Lightning flashes again in the sky above them. Grace hears someone at the front door at night and when she opens it, she sees Ben trying to get the painted red X off the door. 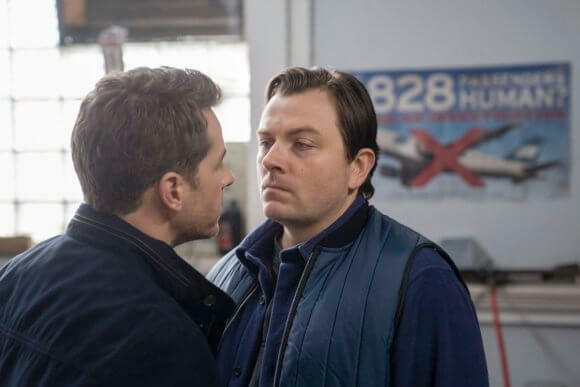 Ben’s emotional and says he knows he can’t explain what’s happening to he and Cal and he can’t stop people from fearing the passengers from 828. However, what he can do is get this ugly X off the front door and she needs to let him. Grace touches his hand gently and tells Ben she needs him here at the house. It’s his home and they’re a team. They kiss and she starts to help him clean the door. At the hospital, Saanvi’s leaving for the night. On the way out of her office she sees someone has painted a red X on her door.